Click the map to be redirected to NOAA's winter weather briefing page including forecasts, warnings and more. The warnings have been upgraded to include blizzard conditions with 25 to 35 mile per hour winds likely, bitter cold arctic air with temperaturs well below zero and possible power outages. Gov. Nixon is holding a press conference with Maj. Gen. Stephen L. Danner, Adjutant General of Missouri, and Col. Ron Replogle, Superintendent of the Missouri State Highway Patrol. 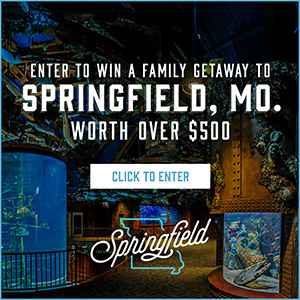 The Missourinet will post details from the press conference as soon as they’re available. 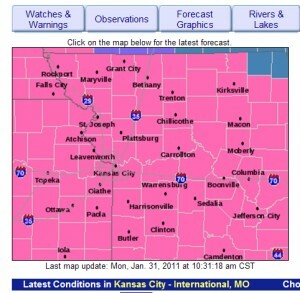 The NWS says the current freezing drizzle from Eastern Kansas to North Central Missouri is only going to get worse. Meteorologist Andy Bailey says the second wave of the storm system is expected to hit during the early morning hours of Tuesday, producing heavy snowfall from 12 inches to 18 inches throughout much of the state, mostly north of the I-44 corridor. Click map to be redirected to NOAA's Winter Weather page, including forecasts, safety and survival tips and more. 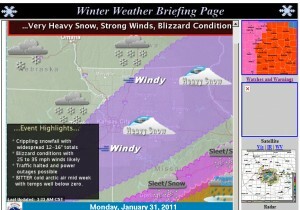 Strong winds will create blizzard conditions. Although the heaviest snowfall will be north of I-44 — from northwest from west central Missouri up through the northeast part of the state, near Quincy, Ill., — ice will be a big problem for the southern areas. Bailey says south of 144 will see significan ice accumulation — from half and inch to an inch — which combined with high winds could cause significant power outtages. Thunderstorms are expected in areas, as well. To keep safe, NOAA asks that residents consider doing the following before driving in winter weather conditions, especially when warnings or watches have been issued. – Keep the gas tank full to keep the fuel line from freezing. – Let someone know your destination, route, and when you expect to arrive. – Keep a cell phone or other emergency communication device with you. – Pack your car with thermal blankets, extra winter clothes, basic tool kit, (including a good knife and jumper cables), an ice scraper and shovel, flashlights or battery-powered lanterns with extra batteries, and high calorie, nonperishable food, and water. – Use sand or kitty litter under your tires for extra traction, especially if you find yourself stuck in a slippery spot.